Megan Mullally is one of those actors who just kind of radiates confidence and poise. In the nearly 100 roles she's had on film & TV, that's made her stand out. She's kind of a character actress - a lot of the time she plays people with huge personalities. If you're a fan of Parks and Recreation, you'll remember she played Tammy, the ex-wife of Ron Swanson- a kind of menacing, toxic seductress. Ron is played by Nick Offerman, by the way - Megan's real-life husband. She also has some unforgettable credits on shows like Bob's Burgers, Childrens Hospital, even a few episodes on 30 Rock. 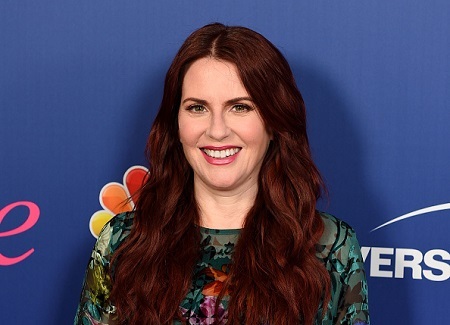 But she's probably best known for her role in the groundbreaking sitcom "Will & Grace" where she plays Karen Walker- a kind of deranged, sociopathic, judgmental socialite who works for Grace on the show. During its original run, between 1998 and 2006, the show earned 16 Emmy awards and over 80 nominations. Last year, the show returned for a 9th season. Megan, who's already won two Emmys for her role as Karen, is now up for her third award in the supporting actress category. Megan tells Jess about why she feels she was born - yes, literally born - to be in showbiz. Plus, she talks about the time she sang the theme song from "Green Acres" on stage at the Emmys with Donald Trump. If you haven't seen the new season of Will and Grace, you gotta! It's free to stream on NBC's website right now. Click here to listen to Megan Mullally's interview on YouTube. Director and actress Tracee Ellis Ross was born in Los Angeles to music executive Bob Ellis and singer Diana Ross. Yes, THE Diana Ross! For a while she worked in indie films and made for TV movies, then in 2000 she broke through on the sitcom "Girlfriends" - she starred as Joan Clayton. The show ran for eight smash hit seasons on UPN and the CW. In 2014, she took on a role in a new series: ABC's "Black-ish." Starring alongside Anthony Anderson, Tracee plays Dr. Rainbow Johnson, an anesthesiologist who's married to Andre, Anderson's character. The show focuses on Dre and Bow, as they're called. They've settled down in the suburbs and started a family. As the kids grow up and the family settles in, Dre and Bow realize the life their kids are leading is very different from their own. The show touches on race, class, and politics. The role has earned Tracee a Golden Globe award for Best Actress, and now she's up for the same honor at this year's Emmys. Tracee talked with Karen Tongson, professor of English and Gender studies at USC, and co-host of Pop Rocket, Bullseye's sister show over here at Maximum Fun. In their conversation, Tracee and Karen go deep into her acting and work directing Black-ish, and she talks about what it was like to grow up in a New York apartment when your mom is Diana Ross. You can stream or buy all four seasons of Black-ish on a bunch of different platforms right now. Like we said before, she's up for the Outstanding Lead Actress in a Comedy Series at the Emmy Awards this year. Wanna see if she'll win it? Tune in September 17. Click here to listen to Tracee Ellis Ross's interview on YouTube. The Outshot: "The Eye Has to Travel"
In this week's Outshot, Jesse talks about Diana Vreeland, the subject of the 2011 documentary "The Eye Has to Travel." 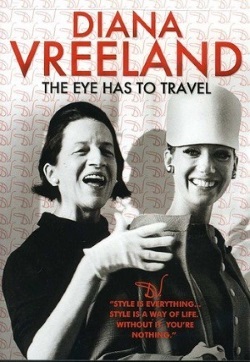 It's about the life of Diana Vreeland. You could say she was a fashion editor, but that certainly undersells her. She is the fashion editor's fashion editor - a transformational figure who carried women's style from the Edwardian to the modern. She convinced the world to wear blue jeans and bikinis. She ran Harper's Bazaar, then Vogue, and changed them both forever. Above all else, she spoke with the perfect combination of audacity and charm. Television legend Henry Winkler is best known for his role as Arthur "The Fonz" Fonzarelli on Happy Days, but he's continued to add acting, producing, and directing credits to his name over the past thirty years. He's also co-written a series of children's books about a boy with learning disabilities, inspired by his own challenges with dyslexia. You can see him currently as Dr. Sy Mittleman on the new season of the [adult swim] show Childrens' Hospital, airing Sundays at midnight, and on USA's Royal Pains.